Life in Attawapiskat is a lot different than a big city, or even a rural town. Here in the north, life is very simple, but also harsh. From time to time, I leave my northern life behind to pursue my music career "down south." But even when I do this, my thoughts are usually back at home with my family, or thinking about my responsibilities to my Cree culture. My oldest son Geeshig is 13 years old -- the age where he will spend the next year learning from me about the male role in Cree society. It's an important rite of passage. It's tough to know exactly how much Geeshig -- his name means "Sky" in Cree -- will learn, but I will do my best to teach him what I know about hunting, navigating the sea, rivers, ice conditions, life in the tundra, ceremonies, and what it means to become a provider and protector. 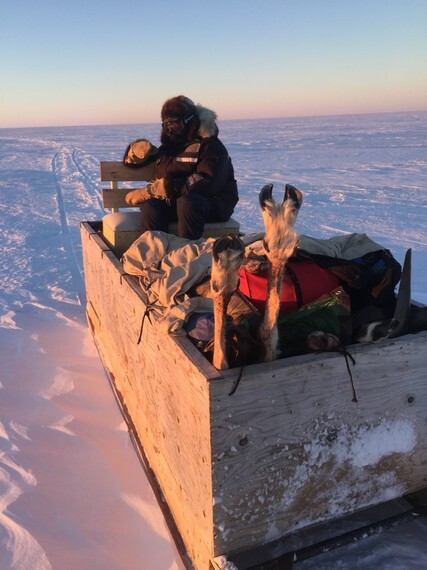 Over the winter I've spent a lot of time thinking about what to teach him first, and decided the best place to start would be by taking him into the tundra to hunt caribou. Hunting is important in the north. We don't hunt for sport or recreation -- we hunt for sustenance. Living in a remote place like Attawapiskat, the cost of purchasing food is outrageous -- more than $700 per week to buy groceries for my family. That's $700 each week! Think about that. So the more we can fill our freezers, with caribou, geese, fish, rabbits, whatever we can, the better off we are. Now it is my turn to pass down the knowledge. Geeshig and I begin by preparing our sleds and gear, which takes a few days, before setting off on our week-long adventure. The plan is to camp 50 miles north of the village. While 50 miles doesn't seem like a long way, up here it feels more like 500 miles. It makes for a long day of travelling, and like any other 13-year-old, my son is "bored" along the way. Haha! I think boredom is inherent to teenagers of every culture, in every place on earth. But Geeshig knows how important this is, so he willingly accepts what he has to endure. Geeshig already knows a lot for his age -- a lot more than I knew. I wasn't able to learn my teachings until I was much older than 13, because of family circumstances. My father died when I was 7 from leukemia and I got bounced around for several years before being taken in by relatives. When I became an adult, other men in the community started taking me out to hunt and teach me about the bush, which I am forever grateful for. Now it is my turn to pass down the knowledge. I've already been taking Geeshig out on the land with me since he was 7 years old. When he was young, he would ride in front with me on the snowmobile. Sometimes he would fall asleep in my arms for hours on the long hauls. Now, at 13, he's almost six feet tall, and can hold his own out there. Already I'm such a proud father. What is to come, I soon learn, will make me even prouder. 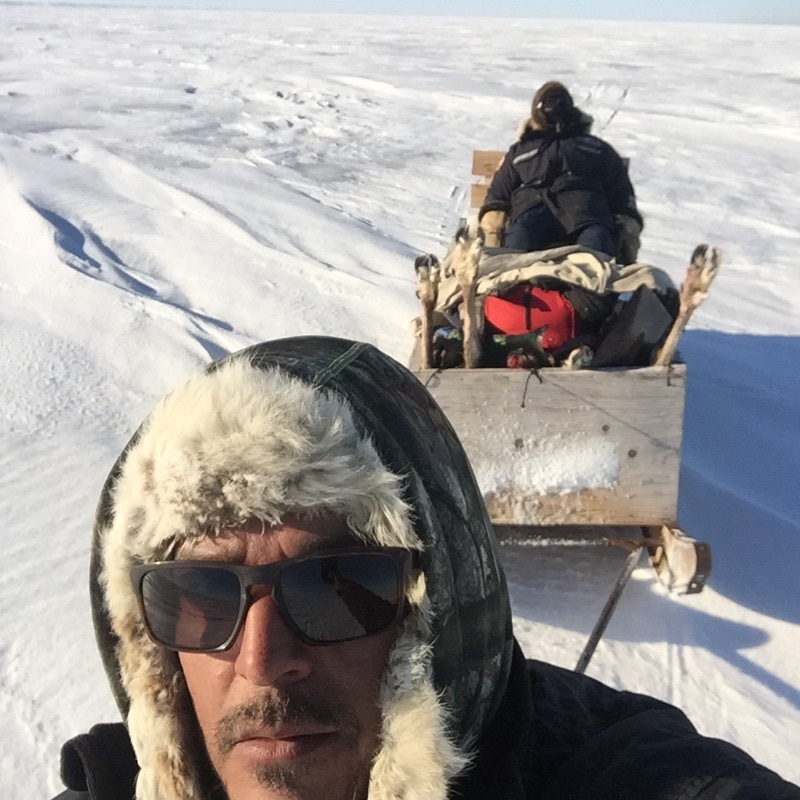 The second day we arrive at our camp Opinigau, 100 miles north of Attawapiskat along the coast. The third day is spent ice fishing and planning our trip into the tundra. I'm constantly looking at the sky and listening for signs of bad weather -- and teaching my son what to look and listen for. The last thing you want is a storm hitting you while you're in the tundra. Three years ago, I was pinned down for five days with two other men in a winter storm in late spring. In those kinds of situations, there is nothing you can do but stay put. The next day we head north into the tundra. The trail is in good shape, and we're able to make good time. 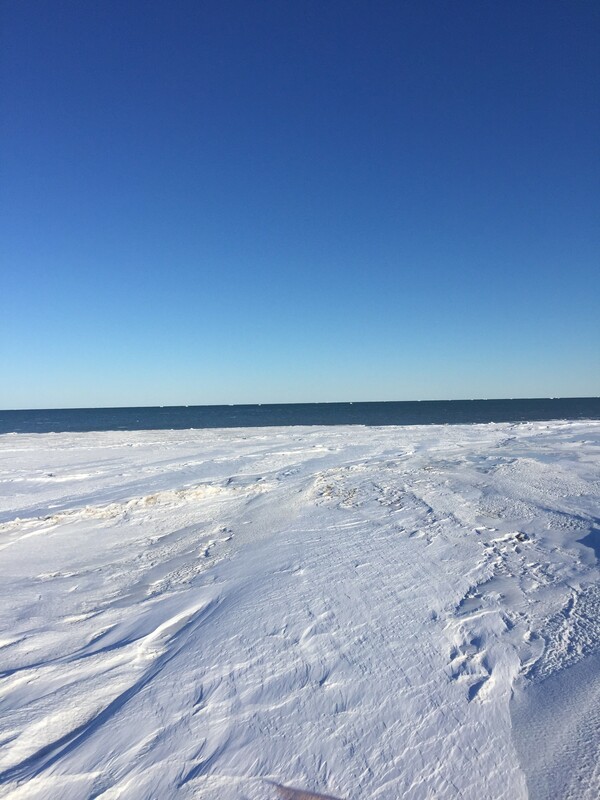 We reach the end of the boreal, and from then on, are travelling on sea ice. 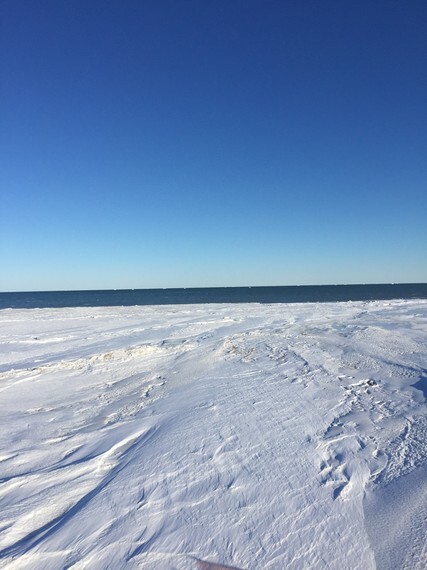 I can see open water one mile away from us, and don't like being that close. But this year, the melt is coming early and the sea ice is going quick. With each day passing, we lose more ice. After a half-day of travelling, we reach Site 415, a radar facility part of the old Mid-Canada line. We seek shelter in a Sea Can container the government left behind for hunters like us to take refuge in. We're thankful it's here. With no time to waste, I quickly make tea and lunch. You must learn to work fast out here. There are no fun and games -- just survival. In less than an hour after arriving, we are leaving again. We head northwest and there are no trees in site for miles, just tundra and ridges. At long last, we are finally in caribou country! 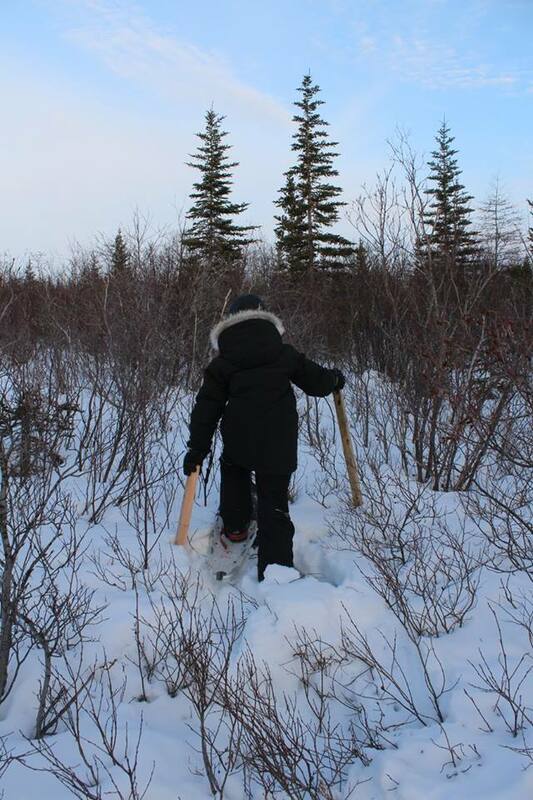 It doesn't take long to find caribou tracks, and I begin tracking. All this time, my son is watching and listening to everything I tell him -- how to tell which way they are heading, how old the tracks are, and which way we will likely see them. We continue west and see more tracks. This is a good sign, meaning there are lots of caribou in the area. At first, he has trouble spotting them. But once he does, I hear excitement and nervousness in his voice. At camp the other day, something told me that a kill was imminent. I can't explain what it was, but I respect it as ancient knowledge passed down from generation to generation. At that time I didn't say anything to my son, because it's too difficult of a concept for him to understand right now. But he will learn this kind of intuition later on, when he is older. Suddenly, I spot a herd of 20 caribou sitting up ahead. I stop and point them out to my son. At first, he has trouble spotting them. But once he does, I hear excitement and nervousness in his voice. What he is feeling is the same thing I recall experiencing during my first hunt. We load the rifles and talk strategy. I sternly tell him not to load anything into the chamber of his rifle, and only to shoot on my instruction. He listens intently, nodding his understanding. We are ready to go, and the chase is on! It lasted 30 minutes, and ended up successful. I shot two caribou, and Geeshig shot two as well. Two! Words cannot describe what I felt! It was such a wonderful feeling to see him get his first kill. Geeshig was shining so bright, and for me, as a father, it was such a proud moment. I am satisfied knowing this hunt will stay with him for the rest of his life. He will always look back on it and be thankful for his dad. Getting your first kill at 13 -- the year when Cree boys become men -- is pretty special. In this next year, I will spend as much time as I can out on the land with Geeshig. It is difficult to find time, with everything else going on, and the many responsibilities I carry for my family, earning a living, and pursuing a music career in urban places far away from home. But I also know, the time I spend out on the land with Geeshig is the most important time I can -- and want to -- be spending. Not only for my family, but also for carrying on the tradition of the Mushkegowuk Cree. "One foot in the past, one in the here and now, on this sacred ground, I am a northern man..."